We are pedaling on our Quint bicycle from Mount Vernon, Kentucky, to Fairbanks, Alaska. This 7,000 mile journey takes us via the southern states to Vancouver Island. From here we will take the Marine Highway to the Alaskan mainland where the final leg of the journey to Fairbanks begins. We departed from Mount Vernon, KY, on Saturday August 1, 2009. We estimate our arrival in Fairbanks, AK, to be in the summer of 2010. We will live in Fairbanks for the year, experiencing the never setting sun and the never ending night. We will discover the way the Alaskans live. Enriching our lives with the exposure to new customs and traditions. 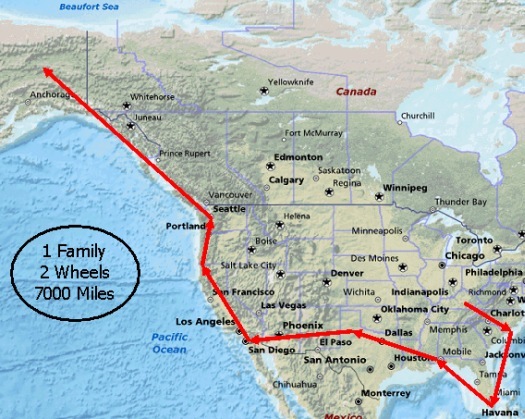 In the spring of 2011 we will decide whether we will pedal across Canada back to the east coast of the United States. We have finished this leg of the journey. Read the journal; from Mount Vernon, KY to Charleston, SC. Read the journal; from Charleston, SC to Fort Pierce, FL. Read the journal; from Fort Pierce, FL to Lucedale, MS.
Read the journal; from Lucedale, MS to Slaton, TX. Read the journal; from Slaton, TX to Tucson, AZ. Read the journal; from Tucson, AZ to San Diego, CA. Read the journal; from San Diego, CA to Cambria, CA. Read the journal; from Cambria, CA to Crescent City, CA. Read the journal; from Crescent City, CA to Port Angeles, WA. We're on this leg of the journey now! Read the journal; from Port Angeles, WA to Prince Rupert, BC. Read the journal; from Prince Rupert, BC to Fairbanks, AK.